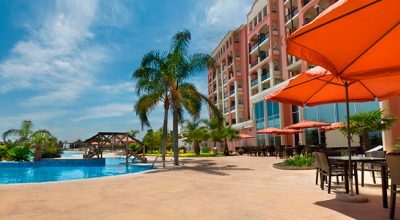 The 4 Star Oliva Nova Beach and Golf Resort is conveniently situated on the beachfront between Gandia and Denia on the Costa Blanca. The hotel is in a privileged location, ideal for golf lovers and for those looking to discover this particular area of the sunny Costa Blanca. The hotel is modern and stylish and offers a high degree of comfort. It has the added benefit of being just a one minute walk to the stunning Oliva Nova beach and its very own golf course by the same name, which was designed by legendary golfer, Severiano Ballesteros. All of the 205 rooms at the Oliva Nova are spacious and extremely well presented offering all of the facilities you would expect from a 4 star hotel including a 49 inch flat-screen TV, free Wi-Fi, full bathroom, air conditioning and a covered terrace. Each room also provides you with views to either the swimming pool and gardens, beach or the stunning Montgo mountains. The facilities at the Oliva Nova are first class and you will find plenty on offer to keep you entertained during your stay. Facilities include a 24 hour reception desk, outdoor swimming pool, fitness centre, a la carte and buffet restaurants, a beach bar, Irish pub, spa and gymnasium. Free Wi-Fi is available throughout the hotel for guests. The Oliva Nova Beach and Golf Resort is the ideal accommodation situated in the perfect location in which to enjoy your golfing break on the Costa Blanca. 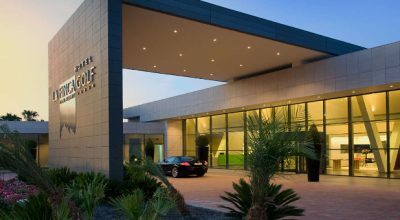 The hotel is stylish and fully equipped with all the facilities you need for a comfortable stay during your Costa Blanca golf break.